Its no secret that Baltic Amber has played an interesting role throughout history in various religions. It wasnt unusual for Amber objects to surface during very early excavations and depending on their form or shape, they were cataloged as having significant to various cults. 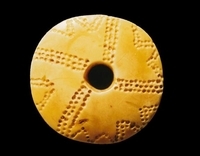 For example, the solar cult which was known for fertility had flat, round amber discs which were enhanced with a serious of dots shaped in a cross. Another cult, the Battle Axe, was known for amulets shaped as small axe heads that were worn to ward off evil or danger. The ancient Romans and Greeks were also heavily linked to Ambers magic powers in that the electrostatic energy Amber gave off also ensured that the wearer would be free from any misfortune. So, too, the Egyptians who used Amber in the process of mummification to protect their beloved in the afterlife. Tiny pieces of Natural Amber have been found inserted beneath the skin over the hands of mummies and often Amber amulets have been found in these ancient grave sites. The form and shape of amulets often featured zoomorphic figurines that served to protect their wearers against any variety of dangers found in everyday life such as hunting. Female figurines, used a symbol for the mother goddess are related to fertility cults. Male figures and phalluses are associated with an ancestor cult or representing symbols of gods and heroes. Famous Hippocrates father of medicine (460-377 BC), in his works described medicinal properties and methods of application of Baltic amber that were later used by scientists. Callistratus states that a short string of Baltic Amber Beads worn around the neck brought relief to the wearer in some cases of severe head and throat complaints. In 19th-century literature we find evidence of Baltic Amber having been used as a healing remedy for virtually all illnesses. Haczewski wrote that Amber was one of the six more efficacious medicinal substances. Amber is probably the only stone which is considered to be of such great use in medicine. Lithuania was a center of artistic amber production for many centuries. The amber artisans created their masterpieces on the orders of the highest social classes. And weve only scratched the surface on this very interesting topic of Baltic Amber in religious history. If you dig a little deeper, theres much more to be learned and fascinating to comprehend.